The project is to develop an interactive system which uses Theremin and webcam as controllers that change channels of radio by proximity and physical movement. Software Defined Radio (SDR) is a technique for turning a computer into a radio (not internet radio). The dancer or performer moves in zones of space which trigger and manipulate the audio signals from Shortwave, ham, FM, AM and other dedicated bands. Movement thresholds will also activate the composer’s sounds and projected images. Commissioned by Harvestworks with funds from theNew York State Council on the Arts with the support of Governor Andrew Cuomo and the New York State Legislature. The proposed composition will develop an interactive system which uses Theremin and webcam as controllers that change channels of a radio by the performers’ proximity and speed of movement. I am planning to use customized SDR (software defined radio) to access local and international broadcasts. Multiple radios will be used, changing channels according to zones of the space, as well as activating sound files created by the composer. The dancer or performer moves in a space loaded with potential. Max/MSP/Jitter and VNS software is used with patches and sounds designed by David Simons. In terms of themes, artistic or philosophic content, that may emerge later; likely a sci-fi reference to advanced life forms, even if extra-dimensional, communicating with us via the electronic noosphere, these visitations from a radio-based highway. (14 years ago!) I dreamt that there was a wall of boombox radios and choreographer Douglas Dunn was dancing solo around them. Just like with the Theremin changing pitch or volume, his proximity to a particular radio, or area of space, changed the channel of the radio. There were multiple radios playing at once, all controllable by the dancer, and not by touching the dial, just focussed movement. It was one of those truly vivid revelations of the future. Liminal Space is a doorway, or threshold to other dimensions. I am translating the player’s proximity and speed of movement, in relation to the antenna of the theremin or in the active zones of a webcam, into a velocity based trigger. Using body gestures in a charged “magical” space. Samples are stacked in hierarchical strata (more velocity or frame difference will trigger one thing, less will trigger another). I also use an “if, then” argument (if the numbers fall between a certain range, then “x” will happen). This includes manipulation of speed, pitch, pan, amplitude, causing gates to open and timers to begin. There is a certain degree of unpredictability built into this method of playing a gestural instrument. I have invited choreographer Douglas Dunn to work with this technology on a new piece to be created for his dance company. Using Edgar Varese’ definition of music as “organized sound”, source material could come from anywhere, including live radio broadcasts (ex: Stockhausen’s “Kurzwellen” or Cage’s “Radio Music”). In our current state of digital technology, artists are doing what has always been done with earlier techniques. “The good poet welds his theft into a whole of feeling which is unique” said T.S. Eliot. The Artist as Medium, McLuhan’s “antenna of the human race”. And from Montaigne, in the16th century, on sampling: “The bees plunder the flowers here and there, but afterwards they make honey of them, which is all theirs; it is no longer thyme or marjoram”. 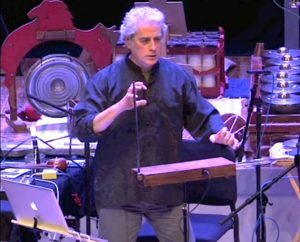 DAVID SIMONS is a composer and performer specializing in percussion, Theremin, interactive sound installations, digital sampling, homemade instruments, and World Music. Recordings of his works include 2 CDs on Tzadik “Fung Sha Noon” (2009) and “Prismatic Hearing” (2004); 3 CDs with Gamelan Son of Lion, including “Sonogram” (Innova 2008); “The Birth of George” opera w/Lisa Karrer (Harvestworks 2003); and with God is My Co-Pilot, Music for Homemade Instruments, Stockhausen (Kurzwellen), Henry Brant, Shelley Hirsch, Denman Maroney, Laura Andel and many others. David’s music for theater, dance and concert ensembles has brought him on World tours. Awards and commissions include the Rockefeller Bellagio residency, NYFA fellowships, NYSCA project funding, Aaron Copland Fund, Jerome Foundation, American Composers Forum; and travel grants to collaborate with artists in Indonesia and Estonia from Arts International and Soros’ Open Society Fund. 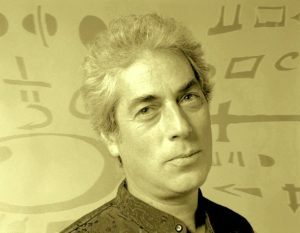 Simons’ composition “Odentity” for the Harry Partch instruments was premiered by Newband in 2007 and is featured on his Tzadik CD “Fung Sha Noon“. David is a graduate of California Institute of the Arts (BFA 1974) where he studied composition with James Tenney, Harold Budd, Morton Subotnick, and Earle Brown. He also has an MA in Media Studies from The New School (MA 2013). His writings on music and sound are published in Radiotexte(Semiotexte#16), EAR magazine, and Soundings. David teaches Cross-Cultural Perspectives at Fairleigh Dickinson University in NJ, was Teaching Assistant in Media Studies at the New School, guest lecturer in music and composition at Ramapo College and SUNY Binghamton, and has taught instrument building and gamelan at Kripalu Yoga Center (Stockbridge, Mass), Avampato Science Museum (W.Virginia), Sternberg Museum (Hays, Kansas), at elementary schools in Paterson NJ, for Young Audiences in NYC, and for the Brooklyn Philharmonic.